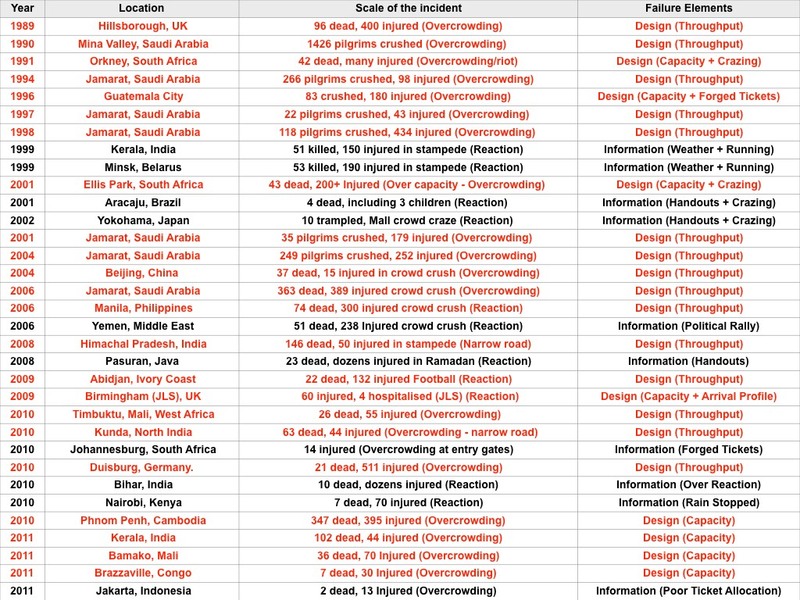 Some of the major incidents over the last 27 years. We teach the principles of phases, influences and modes of crowd behaviour in the workshops. for this we apply the process of meta-modelling the event. 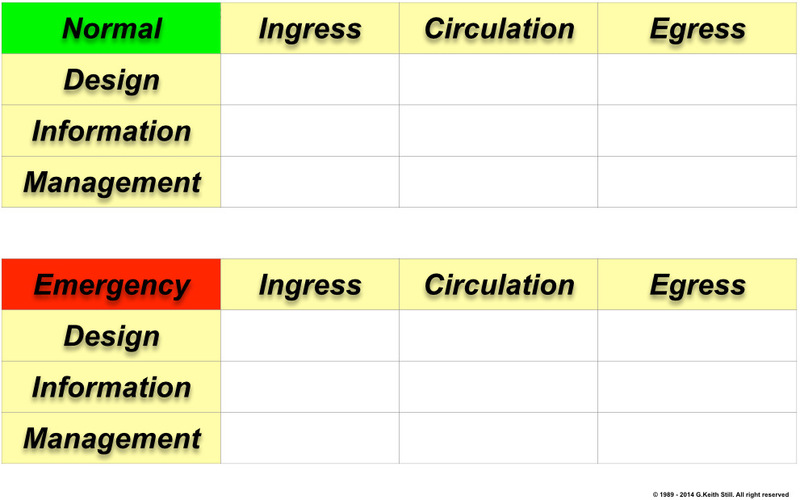 This can be expressed in a matrix (see below) which we populate with the specifics of the event we are modelling. Some examples of how this model has been used for events are shown below. 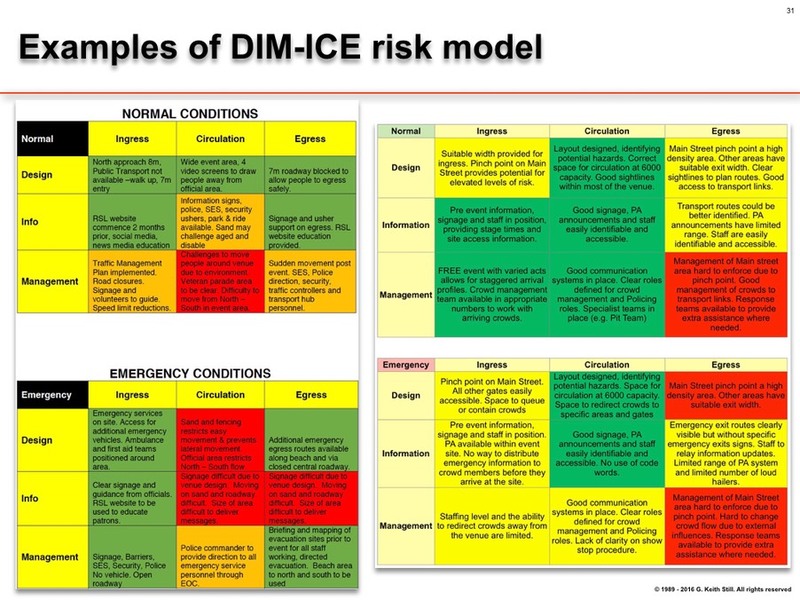 By adding colour to the description you can highlight where in the phases and influences that risks are High (red), Medium (orange) or Low (green).�The aim of this work is to draw the users attention to the underlying elements that give rise to crowd risks. it is a useful checklist to ensure the crowd maangement plan has considerer both the phases and influences of crowd behaviour. The colours assist in both understanding (red needs to improve, orange needs to be monitoried, green is the things you think you do well). Mood (the pervading atmosphere or tone of a place, situation or crowd) = Environment (such as type of venue, weather, music, terrain, hot, cold, noisy) and the Event (nature of the gathering, religious, festival, concert, public speech, demonstration, march, protest, performer) and the Crowd (demographics, character and composition of the crowd). The Mood is a function of the Event (religious, festival, concert, speech), the Environment (hot, cold, noisy) and the Crowd (demographics, character and composition of the crowd). There are many different schools of thought on crowd composition,�categorisation,�behaviour and�demographics. How crowd are�composed, how they may react under different�situations/circumstances and how they should be defined. I use these as a basic�definition for crowd behaviours. Please note crowd behaviour can change from one classification to another during an event (several changes are of�course, possible). I use this only to define the fundamentals of how different crowds may�require different�management strategies and it is�important to both identify crowd moods/behaviours and act accordingly. Casual -�People coming and going; not organised but may be in loose groups. Will accept direction from authority. Well behaved. Cohesive -�Crowd assembled for a specific purpose or reason. No leadership. Expressive -�Crowd Gathering for a common purpose. Under loose leadership or following a particular motive. Not aggressive but sections of the crowd behaviour becoming mildly anti-social. May require active involvement by authorities. Anti-social -�Crowds engaged in acts of civil disobedience or direct action. Some sections may become aggressive and violent while other sections continue with different activities. 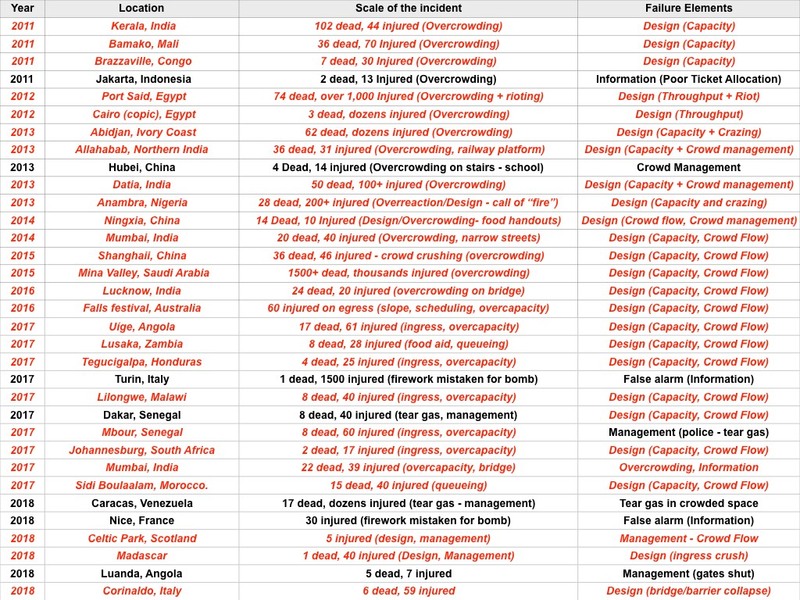 Incident -�Crowd retreating from or reacting to a dangerous situation. Caused by serious anti-social behaviour and/or emergency situation.